1.TQ series of casing tongs are widely used for making-up or breaking-out pipes or casing in diameters of 4~133/8. 2.Tong head is designed as open and can freely clamp and escape from thecasing. 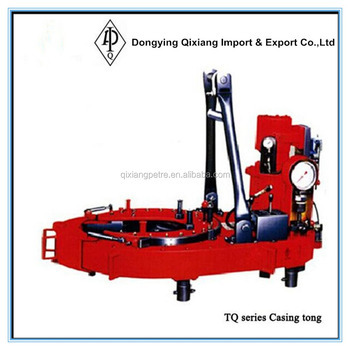 3.TQ Casing Tongs are safe, reliable, and easy to handle with high mobility. 4.This series of casing tongs can be connected with computer controlling units as ideal well mechanical tools for surface operations in oil fields. 5.The tongs are designed and manufactured according to API Spec 7K Specification for Drilling Equipment.